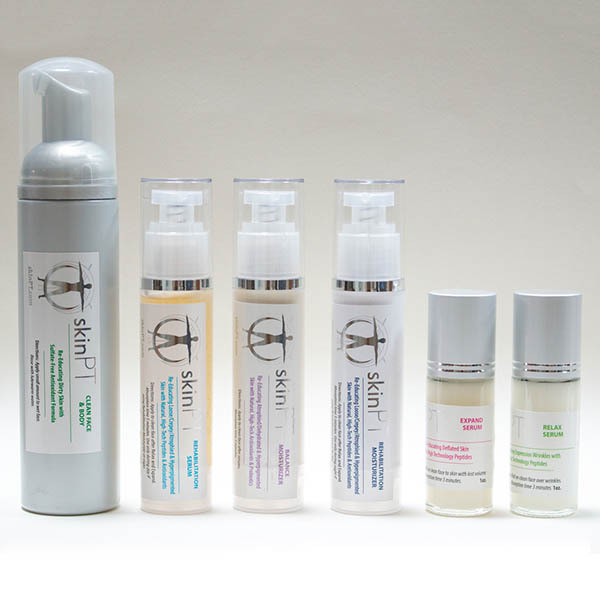 skinPT’s HOME-PACK is high quality skincare to treat your face, neck, and “deck” for about 4+ months. Each package comes with ONE moisturizer or BOTH moisturizers. Choose BALANCE MOISTURIZER, STABILIZE MOISTURIZER, or BOTH MOISTURIZERS. You choose based upon your desired Emoillience Level. Some skinPT users, like to have both moisturizers. One for daytime use and one for night. In which case, you can have it all! “Emoillience Level” means the type of finish a product has after application and absorption. You may enjoy the richness of butters and oils, or maybe a more matte and powdery type of end feel. If you cannot decide, skinPT recommends you go by your skin type. Both moisturizers contain the same active ingredients, just in a different base to support your individual preference and skin type. NORMAL TO DRY SKIN TYPE: Balance Moisturizer has a lightweight consistency, yet it absorbes into a richly emoilliating finish. 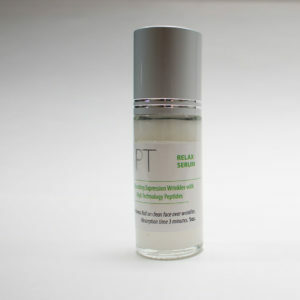 SKIN THAT TENDS TO BE OILY: Stabilize Moisturizer has a thicker consistency that absorbes into a fluffy powdery finish. This is high quality skincare for your face, neck, and “deck”. We loaded it with high percentages of quality ingredients and elegant delivery systems that direct the ingredients to their target. The preservative system is an blend of organic honeysuckle, organic aspen bark and organic radish root ferment. The ingredients are safe, research-backed, and non-GMO. The formulas are also free of parabens, fragrances, dyes and harsh chemicals. 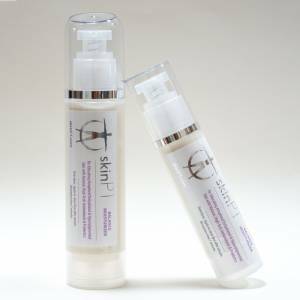 Consider skinPT’s BULK-PACK for even greater high quality skincare bang for your buck! Welcome to the future of skincare in the fast lane! Propanediol, Hexapeptide-10, Acetyl Hexapeptide-8, Pentapeptide-8, Pentapeptide-18, Acetyl Hexapeptide-30, Acetyl Octapeptide-8, Carrageenan (Chondris Crispus), Pseudoaltermonas Ferment Extract, Pseudoaltermonas Exopolysacchrides, Dimethyl Isosorbide, Saccahride Isomerate, Glycerin, Acetyl Hexapeptide-37, Xanthan Gum, Adipic Acid/Neopentyl Glycol Crosspolymer, Trimethylpentanediol/Adipic Acid Copolymer, Lecithin, Sclerotium Gum, Pullulan, Gluconolactone, Sodium Benzoate, Citric Acid. : Propanediol, Hexapeptide-10, Xanthan Gum, Glucose, Carrageenan (Chondris Crispus), Tripeptide-10 Citrulline, Tripeptide-1, Acetyl Tetrapeptide-2, Acetylarginyltryptophyl Diphenyglycine, Dimethyl Isosorbide, Adipic Acid/Neopentyl Glycol Crosspolymer, Glycerin, Pseudoaltermonas Ferment Extract, Hydrolized Wheat Protein, Hydrolized Soy Protein, Lecithin, Amber Extract, Poria Cocos Polysaccharide, Plankton Extract, Adipic Acid/Neopentyl Glycol Crosspolymer, Acetyl Hexapeptide-37, Enteromorpha Compressa Extract, Caesalpinia Spinosa Gum, Gluconolactone, Acetyl Hexapeptide-2, Pseudoaltermonas Exopolysacchrides, Saccahride Isomerate, Trimethylpentanediol/Adipic Acid Copolymer, Sclerotium Gum, Pullulan, Palmitoyl Dipeptide-5 Diaminobutyloyl Hydroxythreonine, Palmitoyl Dipeptide-6 Diaminohydroxybutyrate, Gluconolactone, Sodium Benzoate, Citric Acid. Organic Aloe Leaf Juice (Aloe Barbadensis), Carrageenan (Chondris Crispus), Adipic Acid/Neopentyl Glycol Crosspolymer, Diaminopropionoyl Tripeptide-33, Acetyl Tetrapeptide-22, Sweet Almond Oil (Prunus Amygdalus Dulcis), Emulsifying Wax (Cetyl Alcohol, Stearyl Alcohol, Polysorbate 60), Stearic Acid, Glycerin, Vitamin E (Tocopherol), Pseudoaltermonas Ferment Extract, Acetyl Tripeptide-30 Citrulline, Pentapeptide-18, Acetyl Tetrapeptide-2, Acetyl Hexapeptide-37, Acetyl Hexapeptide-51 Amide, Tetradecyl Aminobutyroylvalylaminobutyric Urea Trifluoroacetate, Palmitoyl Tripeptide-5, Palmitoyl Dipeptide-5 Diaminobutyroyl Hydroxythreonine, Pseudoalteromonas Ferment Extract, Plankton Extract, Sunflower Seed Oil (Helianthus Annuus), Organic Shea Butter (Butyrospermum Parkii), Organic Jojoba Seed Oil (Simmondsia Chinensis), Avocado Fruit Oil (Persea Gratissima), Organic White Willow Bark Extract (Salix Alba), Organic Neem Seed Oil (Melia Azadirachta), Organic Rosemary Leaf Extract (Rosmarinus Officinalis), Organic Sunflower Seed Oil (Helianthus Annuus), Lecithin, Xanthan Gum, Palmitoyl Dipeptide-5 Diaminobutyloyl Hydroxythreonine, Palmitoyl Dipeptide-6 Diaminohydroxybutyrate, Pseudoaltermonas Exopolysacchrides, Saccahride Isomerate, Trimethylpentanediol/Adipic Acid Copolymer, Tetrasodium Glutamate Diacetate, Gluconolactone, Sodium Benzoate, Citric Acid.